This is the un-Baghban of Hindi films. A son is a son 'til he gets a wife but a daughter is a daughter all her life...this age-old saying pretty much sums up the movie. "Mai..." often leaves us teary-eyed with its portrayal of a generation that doesn't know how to value its elders. First things first. Can Asha Bhosle act? Yes, the veteran singer does a pretty decent job. 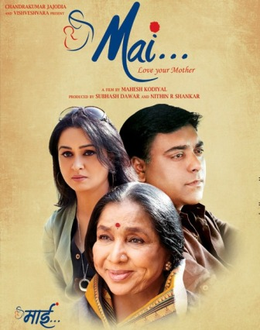 Mai may not be an out of the box concept but definitely deserves a watch for singer Asha Bhosle's stupendous acting debut. Her evocative performance forms the highlight of the film. This is a movie that touches you with some very subtle performances by actors of the film. Too bad, because she can really act and act so well that she can leave you teary eyed in a matter of seconds.